iOS 4 brought tons of new features to both the iPhone and iPod touch, the major one being multitasking or task switcher. But if you prefer Exposé style of multitasking in OS X, then Multifl0w is for you! We covered this app last year as well for iOS 3.x, but this new version which has just been released is compatible across all iOS based devices, including iPad on iOS 3.2.x and iPhone on iOS 4.x. Exposé-like multitasking for iOS! Works with iOS4, and iPad! Totally rewritten for speed, reliability, a redesigned interface, and iOS4! 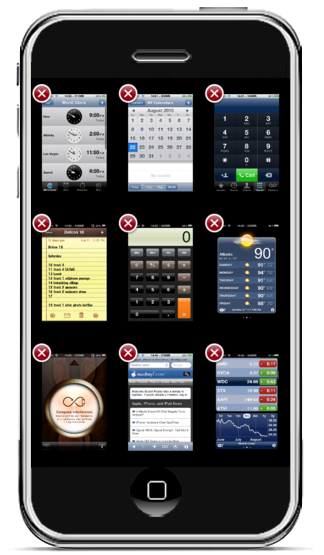 Multifl0w shows all open apps (up to 9) on the same screen, for easy and quick task switching. The tabs are re-arrangeable, just drag an drop! In iOS4, Multifl0w can work alongside or totally replace Apple’s task switcher! Also compatible on iOS 3.1.X, just be sure to install the free app Backgrounder. Also, on iOS4, Backgrounder enables more customization so you can get the multitasking style you want. With Multifl0w, you get up to 9 previews of the apps running in the background and you can stack them any way you want by just swiping your finger over the previews. Since iOS 4 for iPad won’t be available anytime before fall of this year, Multifl0w is your best bet for now if you want to experience multitasking on your iPad. You will of course need to have a jailbroken iPhone/iPad/iPod touch to install it. Follow our step by step guide posted here to jailbreak your iPhone, iPad or iPod touch with JailbreakMe if you haven’t already. Multifl0w is available on Cydia for a price of $4.99 which is quite cheap for what it has to offer. It runs on top of Backgrounder so you will have to download that too from Cydia for free. Multifl0w is fully compatible with iOS 3.1.x, iOS 3.2.x and iOS 4.x. It would be nice if ProSwitcher had iPod controls and orientation lock too, so then we could eradicate iOS’s switcher. So… You finally tell us about this after ProSwitcher HD alpha for iPad has been available for months? I know you did do an article about that, but you make this sound like an advertisement. ProSwitcher is quite cheap too, $00.00 – how much is that in euros anyone? Are you guys sure you’re still covering MS? Increasingly I just see Apple article after Apple article. I know! I’m tired of seeing all this Apple stuff. I believe ProSwitcher HD is only for iPad whereas this can be used on both iPad and iPhone. Well, I bought multifl0w months back when it was out for 3.x, which was great but never really picked it up. Nice to see the license carried over but still a bit buggy on my end. E.g. having to respring if left on the multifl0w screen and the phone goes to auto-lock. Good port all the same and another nice way to ensure some of the more resource intensive apps (i.e. TomTom) aren’t still running. Name one interesting Microsoft thing lately. Though I have to admit these “app reviews” are getting old. How do I find the ipod controll with this ?